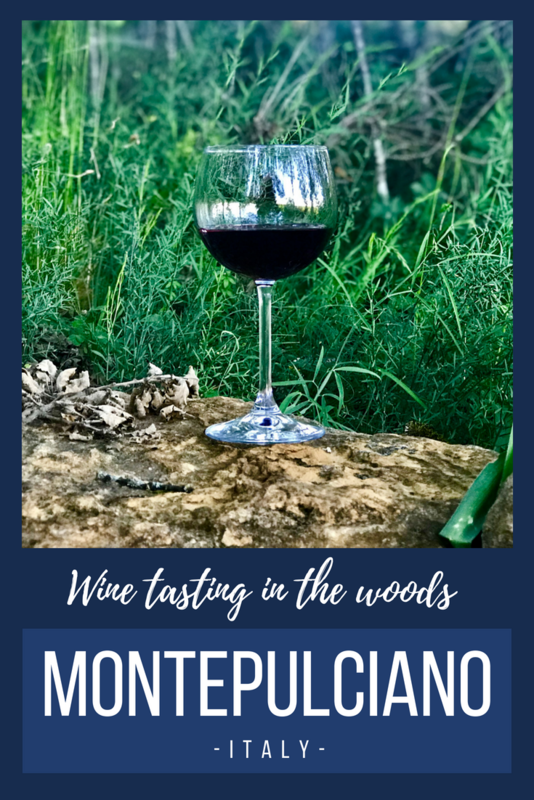 When we went wine tasting in Tuscany (can I just interject that I’ve dreamt about saying those words for quite some time) I had no idea what to expect from our visit to the town of Montepulciano, other than we would likely be tasting Vino Nobile, the typical wine of the region. One of the beautiful views near the Podere della Bruciata vineyard. 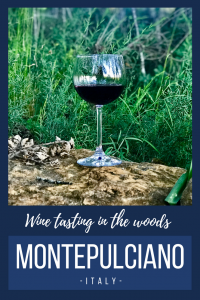 Made largely from the Sangiovese grape, Vino Nobile de Montepulciano is a full-bodied, ruby red wine and I couldn’t wait to taste it in Tuscany (there, I just had to say it again). 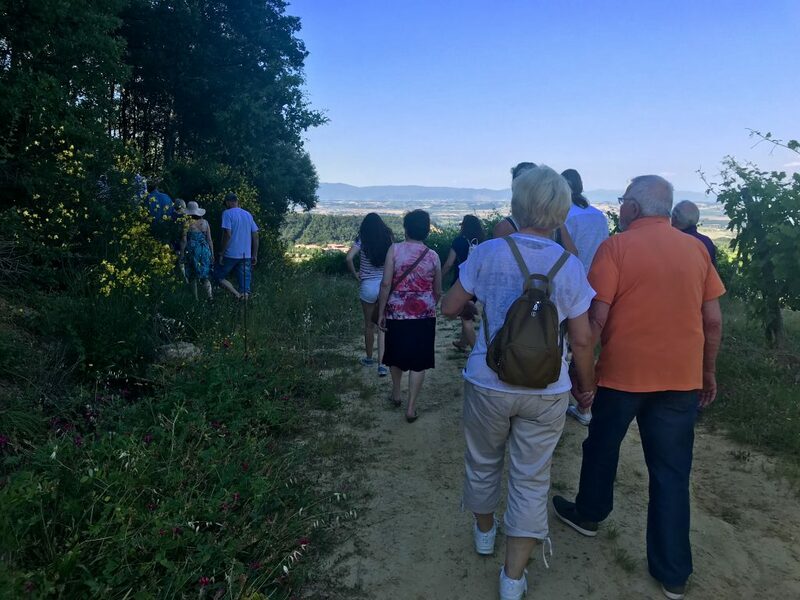 But before our hosted tasting at Podere Della Bruciata winery, we had a little time to explore the medieval city on the hill. Our wonderful host and driver, Massi, gave us a complimentary transfer to Montepulciano. He graciously offered to drive us right to the Piazza Grande at the very top of the hill. 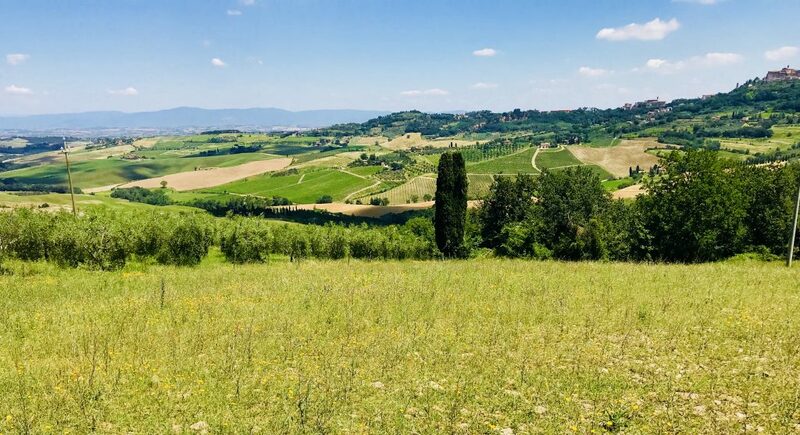 From there, we were able to take in the incredible views of the Tuscan countryside. 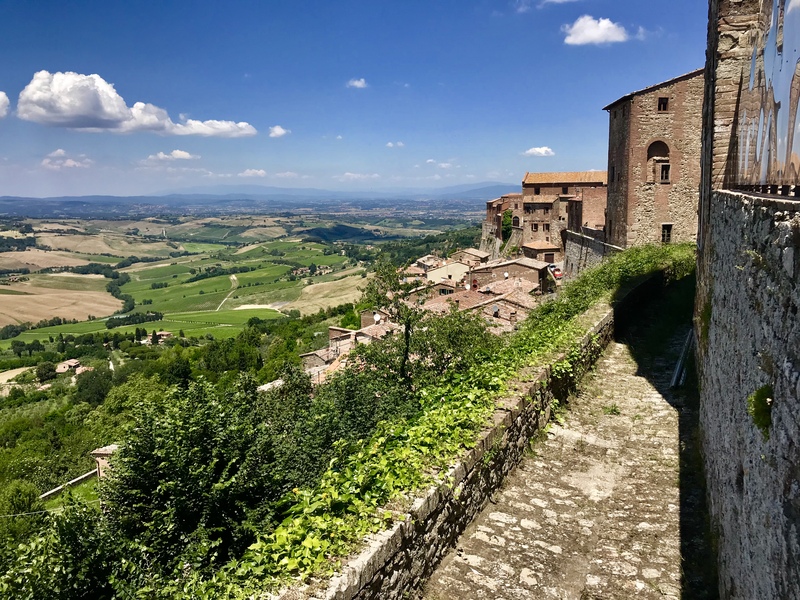 A view across the countryside from the walled city of Montepulciano, in Italy. Steve and I spent several hours walking slowly down the hill through the narrow streets, stopping at small shops that sell everything from wine and cheese to shoes and clothing. Later that afternoon, we went to the Villa Ambra hotel, whose owners had invited us for a complimentary stay and wine tasting. We got settled in the Doppia Superior room which was absolutely beautiful. The Villa Ambra is an 18-room, family owned bed and breakfast. The hard work and love that the family puts into every detail makes this an absolutely stupendous agritourism destination. Our room at Villa Ambra was both clean and comfortable. In addition, it had a king-sized bed, private bathroom, and air conditioning that worked extremely well. Our room was newly renovated. 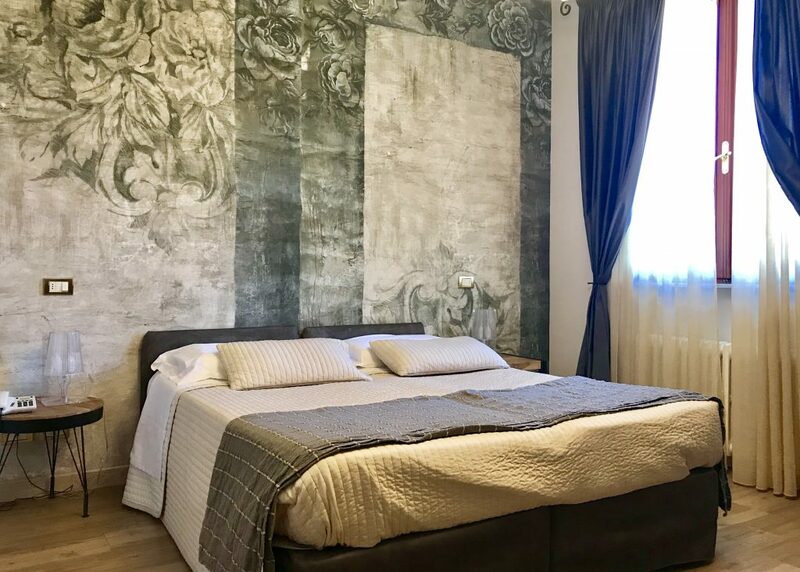 It included a comfy king bed with luxurious bedding and an artistic wall covering that made me feel truly immersed in Tuscany. We took our time settling in to our lovely accommodations and relaxing a bit before the wine tasting. 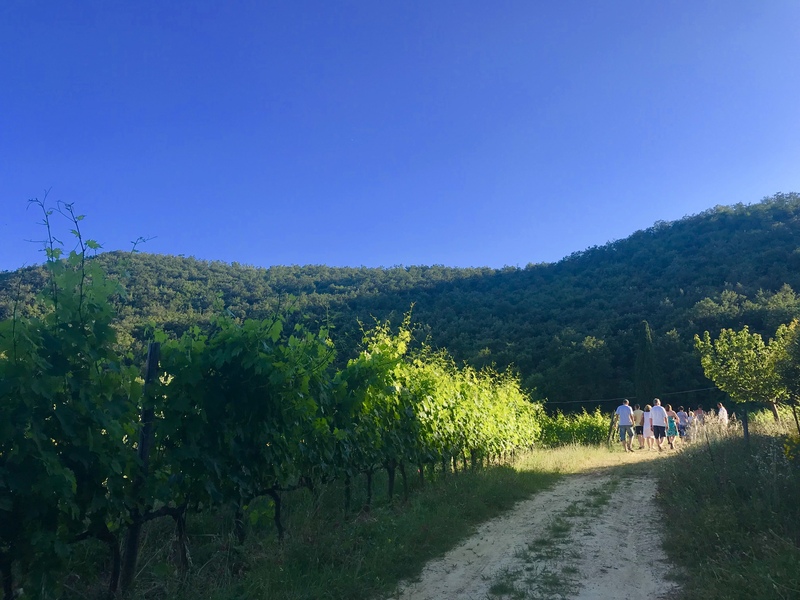 By late afternoon, it was time to head to the lobby to meet other guests for a tour and tasting at the family’s winery, Podere Della Bruciata. We got in vehicles and drove down the highway a bit to the vineyard entrance. We parked, and then walked down a dirt road while learning firsthand about the vines. Andrea explains the processes they use to grow and select grapes at their winery. 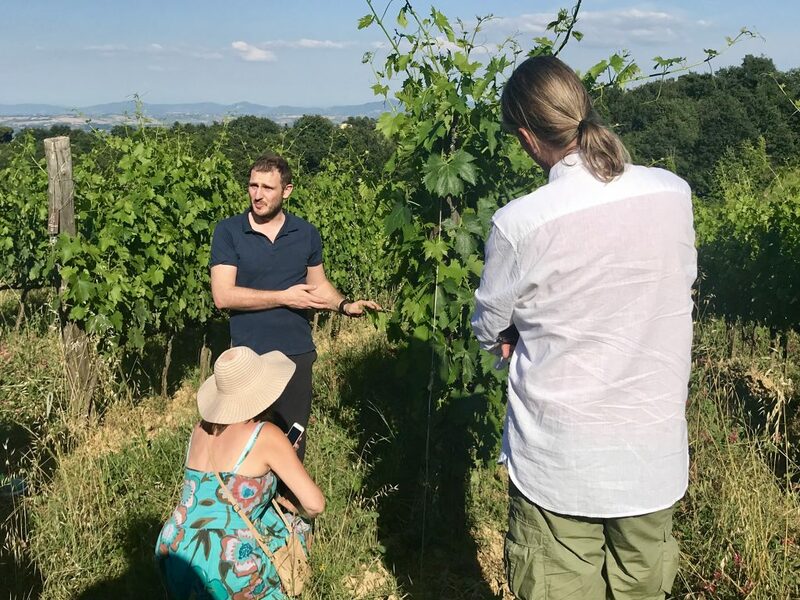 Andrea Rossi, a third-generation wine maker, was a wonderful guide and explained the processes they use to grow and select grapes for their wines. He was a great teacher, and answered all our questions along the way. As we continued our walk with him through the vineyard, I noticed the people in front of me turning off the road and following Andrea into the woods. Now you should know I’m not exactly fond of unknown nature excursions and was a little apprehensive about what was in store. Would there be more hiking? A wildlife encounter? Was I going to regret not bringing bug repellent? Wine tasters head into a small clearing in some woods for the wine tasting. Nope. We were actually being led to the site of our wine tasting. To watch a 47-second video with my reaction, click here. Just a few steps into the woods, we found ourselves in a sort of secret hideaway. We stood in a cleared area shaded from the hot, Tuscan sun, surrounded by rock benches. In the center sat a large boulder that served as an exquisite table for our wine tasting and food pairing. It was glorious. I’ll pause here and let the photos do the talking. Our hosts put out quite a spread for our wine tasting. It included bruschetta, cheeses, jams, salamis, and prosciutto. Both friendly and hard-working, Elisa and Andrea make every guest feel special and welcomed. 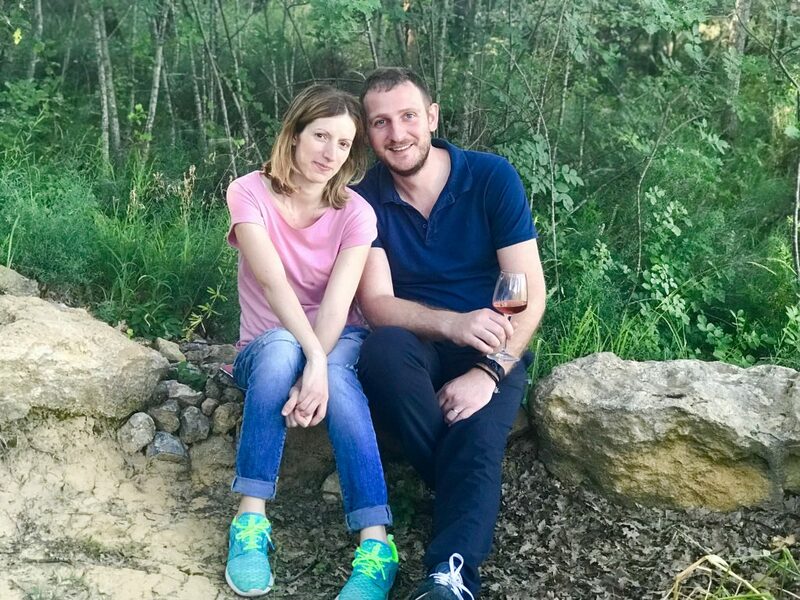 Their efforts made this unique wine tasting experience something we’ll never forget. Andrea explains all that went into making the wine as guests listen and savor the result in a beautiful clearing in the woods. 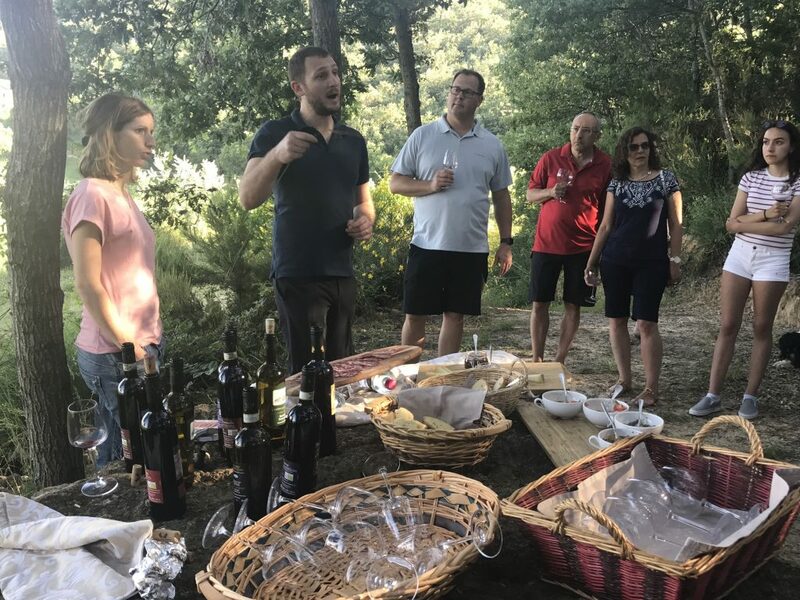 We enjoyed the company of the other guests in a relaxed atmosphere as we tasted a variety of wines, each paired with delicious cured meats, cheeses, and homemade jams. 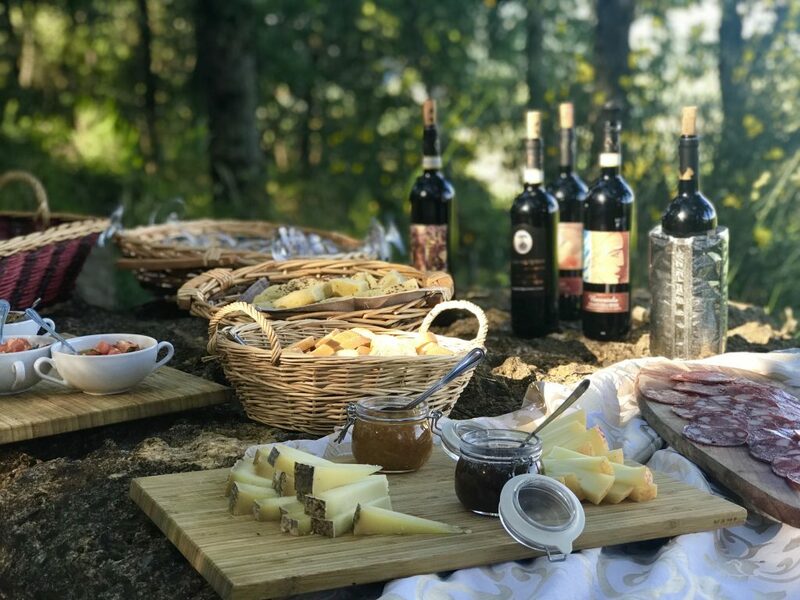 It was almost surreal; we were tasting wine in the woods in Tuscany. Pinch me! At the conclusion of this amazing experience, we walked back to the cars while watching the sun set over the Tuscan hills. The group of wine tasters walks along a road in the vineyard. Back at the hotel, we met up with our hosts Deb of Italy Unfiltered and her husband Massi the Driver, for dinner at the Albergo Ristorante Villa Ambra. 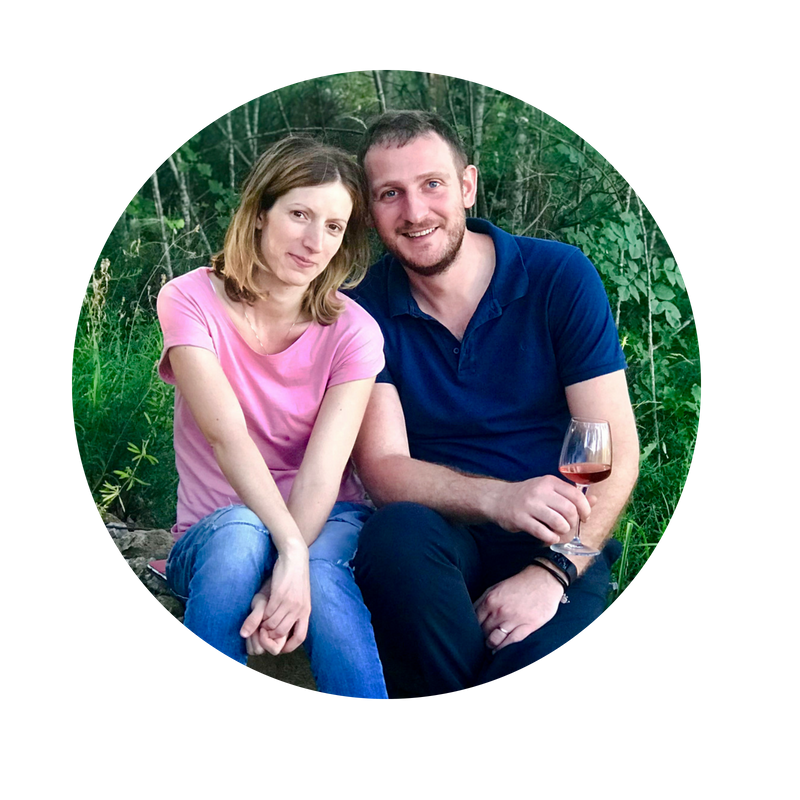 Andrea helped us select two wines, one that he’d crafted and the other created by his uncle, Marzio Pagliai. Then, the family began serving us a traditional Tuscan meal that turned out to be one of the most exquisite dining experiences we had during our entire stay in Italy. 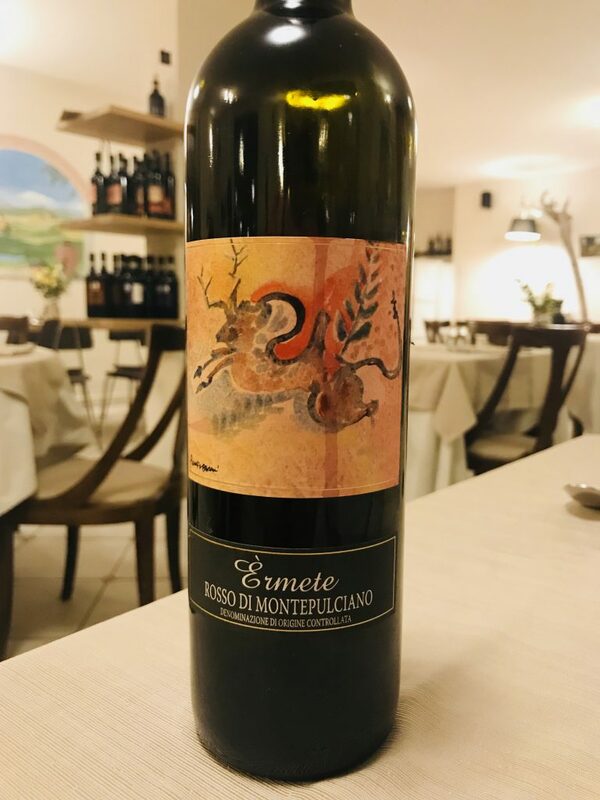 The family’s winery, Podere Della Bruciata produces several wines including, “Ermete,” a Rosso di Montepulciano (red wine from Montepulciano). The first course was bresaola, a cured beef sliced thinly and placed atop a bed of lettuce dressed with lemon juice and olive oil. 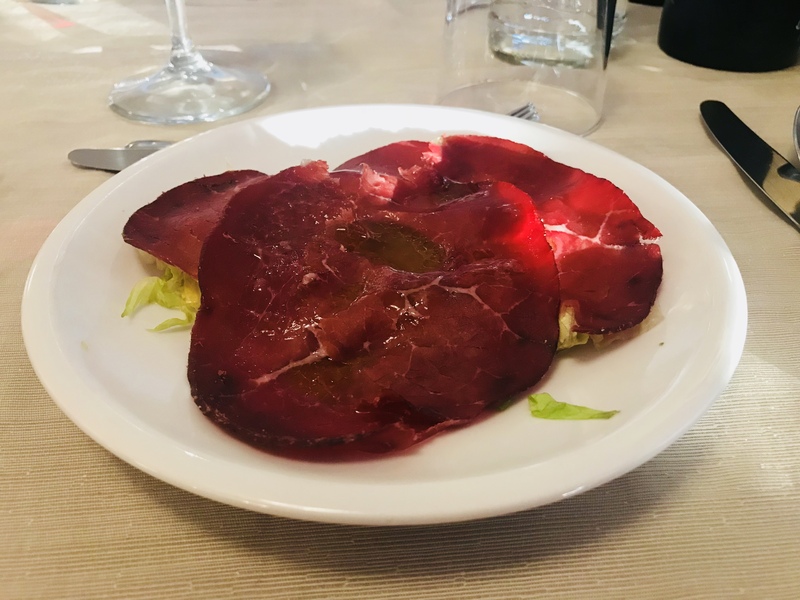 Our meal started with bresaola, cured beef sliced thinly and placed atop a bed of lettuce dressed with lemon juice and olive oil. Next, came my favorite course (pasta of course) which was linguini pasta with cinghiale, otherwise known as wild boar. It was incredible. Perfectly cooked al dente noodles in a creamy, savory sauce garnished with fresh parsley. Yes, I ate all of it. Every bite. And Steve was noticably disappointed that I didn’t ask him to help finish my plate. 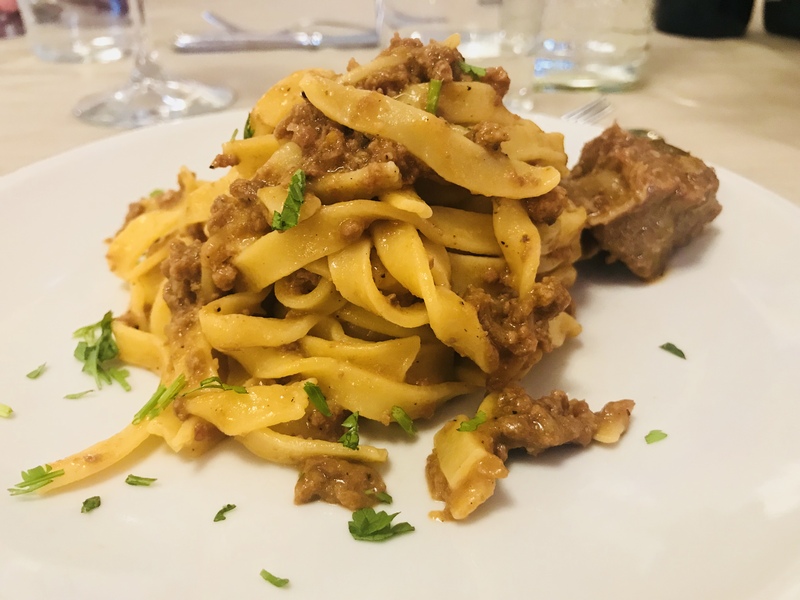 The pasta course: linguini pasta with cinghiale (wild boar). It was a-maz-ing. Our main course was rosemary beef steak served with a grilled, stuffed onion and freshly picked garbanzo beans from the owners’ garden. 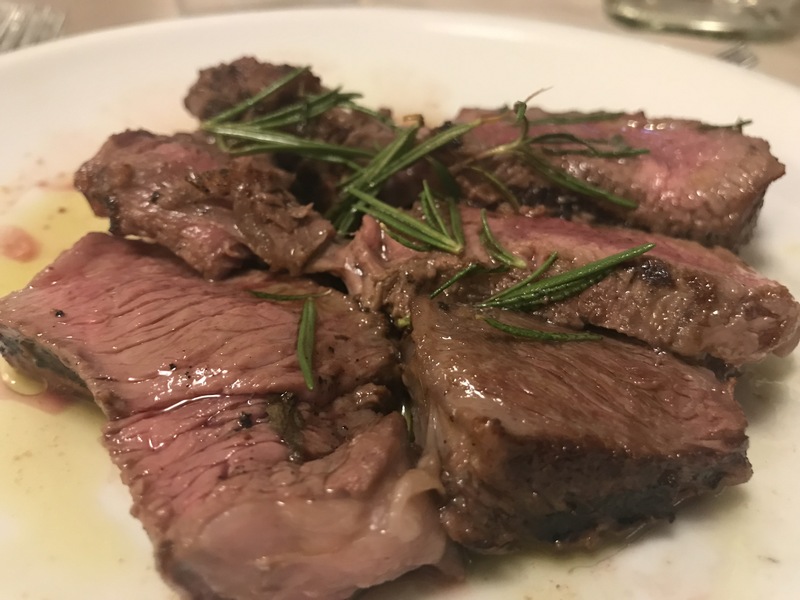 Our main course at dinner: sliced steak cooked to perfection and topped with fresh rosemary. 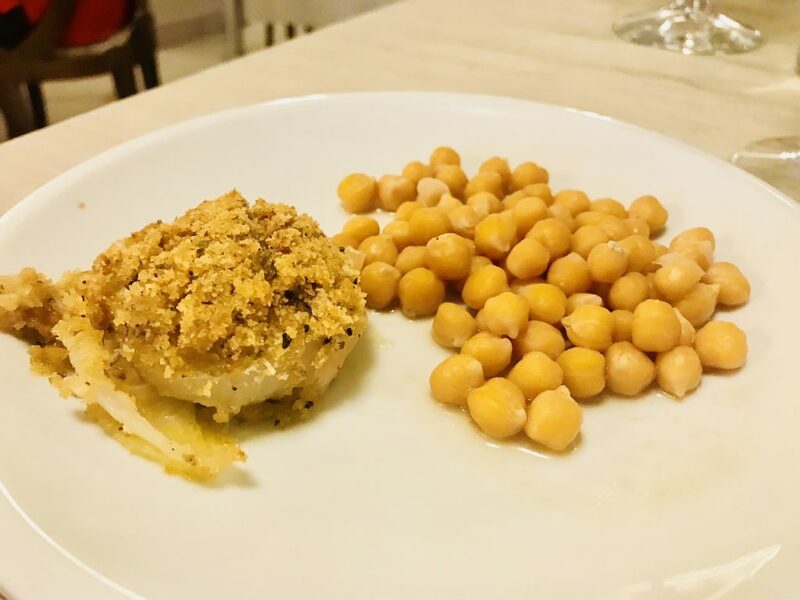 On the side: a baked onion half topped with crunchy, seasoned bread crumbs served alongside garbanzo beans freshly picked from the owners’ garden. Unsure if we could eat another bite, we somehow found room for a slice of lemon cheesecake for dessert. 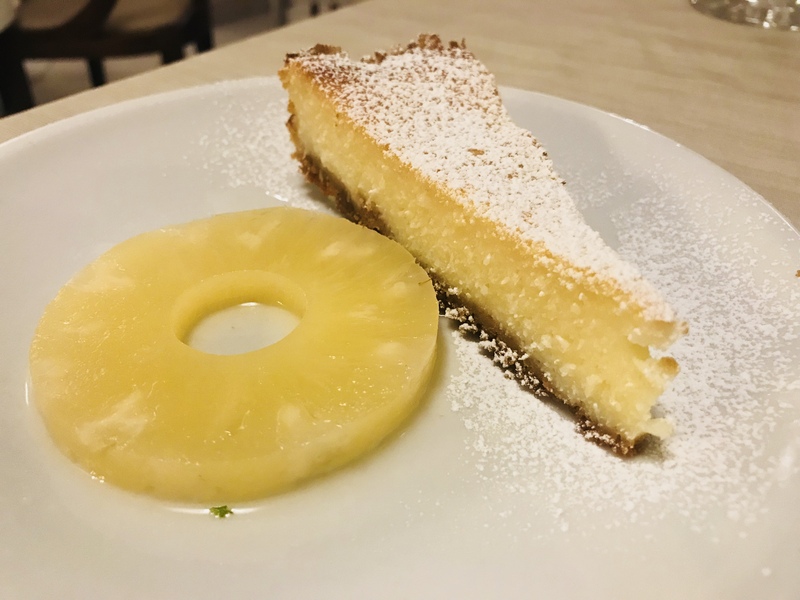 Dessert: Lemon cheesecake with a pineapple slice. Yum! After dinner, we sat and visited with Deb and Massi under the stars on the patio outside before heading to bed for a wonderful night’s sleep. Honestly, does it get any better than this? Guests can retire to the patio after dinner to enjoy a relaxing Tuscan evening. The next morning, after sleeping like babies in the comfy bed, we woke to a farm fresh breakfast spread. We enjoyed a table filled with breads, meats and cheeses and a host of other delectable treats, including homemade cakes and jams. 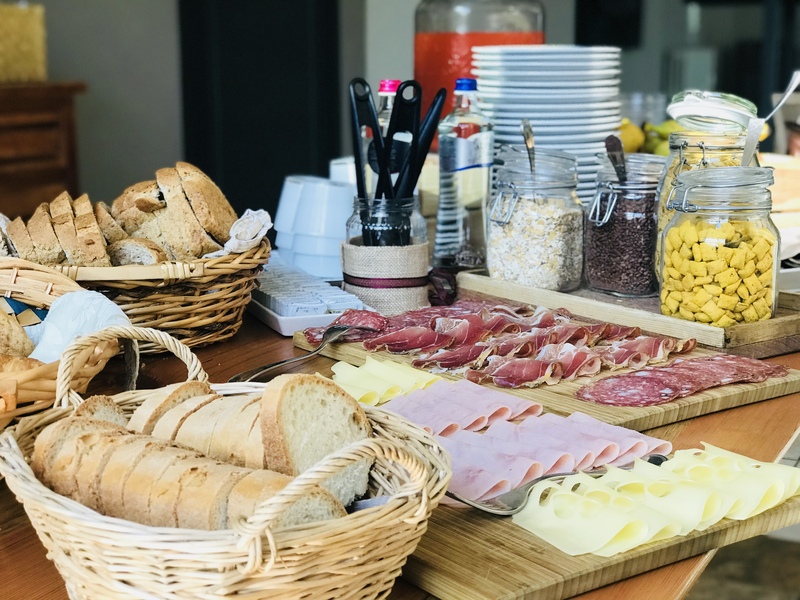 A beautiful breakfast buffet greets guests in the morning. 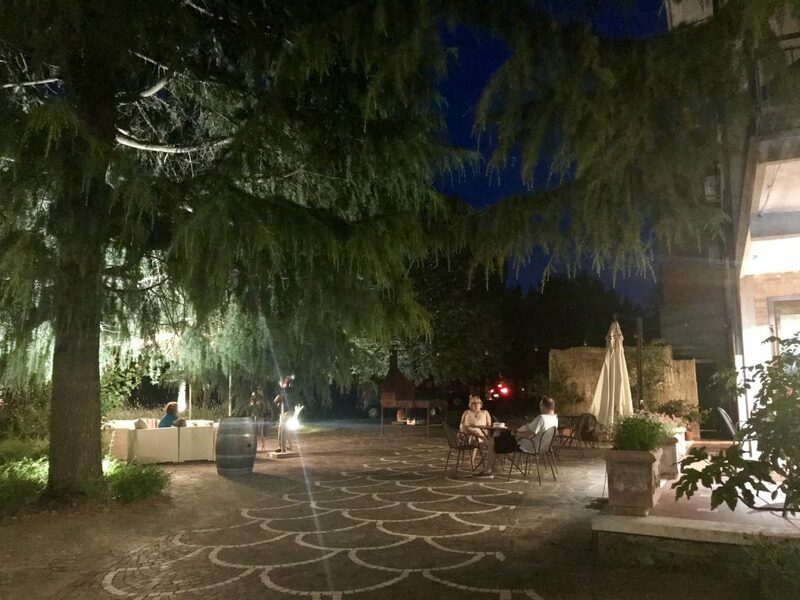 Let me just say that one night at Villa Ambra was not enough for me and according to the owners, most people feel the same. Andrea said many of their guests stay for one or two weeks at a time. He said people relax at the hotel or by the pool and enjoy wine and cheese tours and tastings in the area. In fact, some guests even come during the late fall to participate in the grape harvest and wine bottling. Villa Ambra is open from March through November. The main entrance of the Villa Ambra hotel. 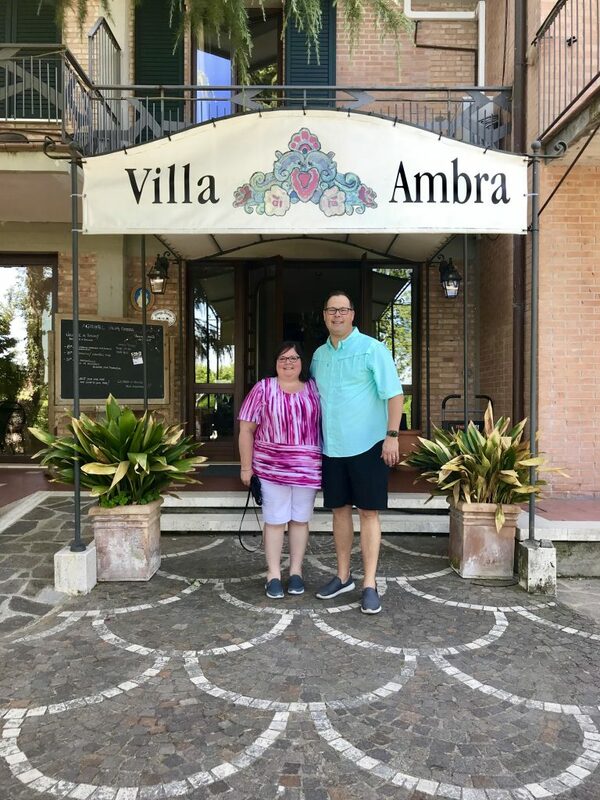 We want to thank Andrea and his wife Elisa and everyone at Villa Ambra for hosting us and making us feel like a part of their incredible family. We can’t wait to come back. Note: While the goods and services mentioned in this article were provided to us free of charge, the opinions are our own. For more information about Villa Ambra, visit their website at http://www.villaambra.com/en/. Our first day in Rome, Italy, was quite an adventure. But who cares? We had wine.